Terry Brown, executive director of the Falcone Center for Entrepreneurship at the Whitman School of Management, was recently elected to a three-year term as a member of the Business Council of New York’s board of directors. In addition, he received an appointment to the Public Policy Institute of New York, Inc. 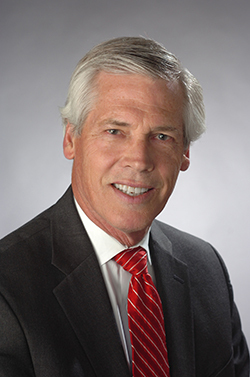 Prior to joining the Falcone Center, Brown was involved in a number of entrepreneurial projects, held several high-level positions at O’Brien & Gere from 1975-2011 (including chairman, chief executive officer and president) and served in the U.S. Marine Corps. Most recently, he was president and chief executive officer of Warner Energy Solutions, LLC, a start-up company focused on developing renewable energy and environmental projects. Brown has extensive experience in executive leadership, project management, strategic planning, fundraising, marketing, branding, development, mergers and acquisitions, grant writing and developing business models. He also holds three patents. The Business Council of New York State, Inc., is the leading business organization in New York State, representing the interests of large and small firms throughout the state. Its membership is made up of thousands of member companies, as well as local chambers of commerce and professional and trade associations. The primary function of the organization is to serve as an advocate for employers in the state political and policy-making arena, working for a healthier business climate, economic growth and jobs. The Public Policy Institute of New York State, Inc. is a research and educational organization whose purpose is to formulate and promote public policies that will restore New York’s economic competitiveness. The Falcone Center for Entrepreneurship is the outreach arm of the Department of Entrepreneurship and Emerging Enterprises in the Whitman School of Management. Its mission is to facilitate entrepreneurial activity on campus, in the local and regional community, and beyond. The Falcone Center offers a portfolio of innovative programs and initiatives organized into two areas: student and campus-focused initiatives and community entrepreneurship programs.